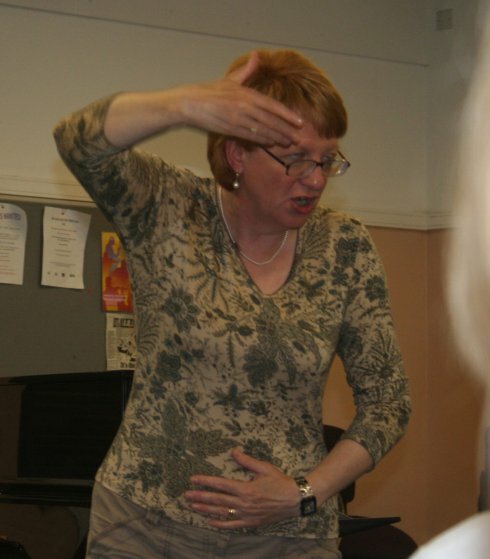 This event brought Susan Hollingworth to Stevenage to teach people to have fun singing (and learn a bit as well!). With about 40 attendees and only about 25% from the choir it was a very wide skill range...NO music books or sheets to work from.....She taught us simple songs easy to learn by ear (so you didn't need to read music). In 5 minutes we were all happily singing simple tunes ... then the tune would become a two part round and suddenly people who hadn't sung in a choir were singing in parts.... then the two part round becomes a four part round. To make it easier for her to see who is doing what we all learnt actions to the song. 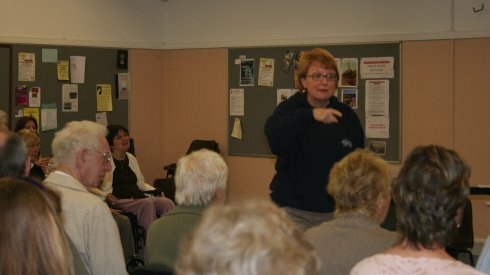 The picture below shows some of the hand waving going on whilst we are singing in parts. Then a new tune is begun. An African song in 3 parts. We all learn the parts but then the group is split into 3 where each group sings one of the parts. 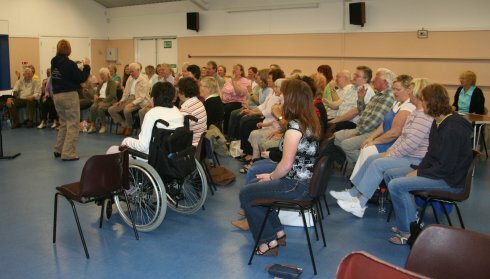 Then we all stand up sing our own parts and gently move in time with the music.....Now for the hard part........Walkies! We all walk round and pass by each other still singing our line in the three part harmony.......As choir singers we are normally used to this idea of someone bawling a different tune in our ear but, surprisingly enough, in this environment even those amongst who haven't sung much seem to manage fine. An effortless way to develop the skills of listening to others elsewhere in the room singing your tune and singing along with them. We didn't spend long walking around - Susan had us working on a wide range of topics in the rest of the 2 hour period. We covered things like improving your singing posture (both standing and sitting down), the tuning of your voice, improving breathing, improving the quality of your voice by understanding about the resonances in the face. One of the things we, as choir members, took away was "The Hoodie"
[Apologies Susan, I'm not sure the photo does you justice]. In this picture we are practising breathing when hitting high notes and Susan is explaining the idea that if we imagine a hoodie going over our head when we go for those high notes we won't change our head position and lose tone of our voices and also envision hitting the notes from above. All in all......A terrifically absorbing 2 hours where both skilled and non-skilled singers learnt new things easily and with much fun. Please Sir........Can we do it again sometime?